If you can’t get enough of spicy or masculine scents, The Lit Wick Candle Company might be worth checking out. 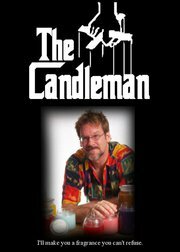 According to The Candleman, their newest fragrances include Bacon, Blackberry Fizz, Cinnamon Stick, Mulled Cider and Tusk (cucumber, cilantro and wasabi combo). Other interesting scents include: Campfire, Fried Ice Cream, Ginger Lime, Leather, Grass and Winter Pine. If you’d like a more traditional soothing vanilla or apple pie, you’ll find that at The Lit Wick Candle Company as well. Prices begin at $5 and don’t go past $20.50.